Caldric Blackwell's easy chapter book. Debut children's book author Caldric Blackwell's adventure easy chapter book, "The Enchanted River Race," begins with a bang and rockets forward until it finishes. 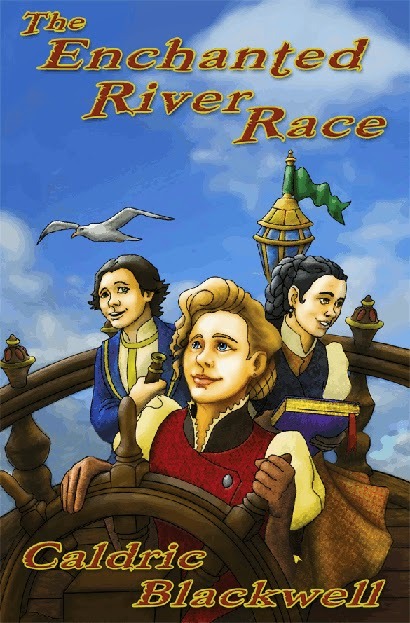 The easy-to-read book revolves around eleven-year-old Amy Lorovia, a young, timid girl who has been selected to represent her district in her village's annual river race, and her two best friends, twins, Silas and Bridget. During the race, the three children must tackle magical obstacles and mysterious riddles to beat out the competition. The plot is creative, and the characters are well-developed. The writing is appropriate for six to eleven-year olds, without being too bland. The illustrations greatly complement the text, although they are a bit simple. Overall, the the book's imagination and writing make it a worthwhile read for any young reader. It is available on Kindle and in hard copy.